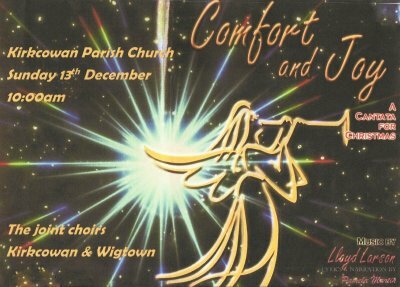 'Comfort & Joy' - A Cantata for Christmas - Kirkcowan - What's Going On? on Sunday 13th December 2015. Kirkcowan and Wigtown joint church choir has been in existence for around ten years, originally coming together only to sing on special occasions. We moved on to tackling larger works and this year’s Cantata will be the fifth such musical adventure we have undertaken. Come along and experience our Comfort and Joy!